Ever since he was a small boy, growing up in Porto, Portugal, José de Meirelles has loved to cook. Inspired by his parents young José relished and actually looked forward to his kitchen chores. Still, it was his interest, but not yet his career choice. He ultimately attended business school and became a banker in Portugal; yet food and cooking always remained a dominant theme and passion in his life. José moved to the United States and decided to attend the French Culinary Institute. 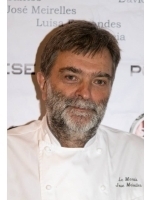 He graduated in 1987 and worked at the famed La Réserve and also at Maxim's with the brilliant chef, Jean-Michel Diot. José moved to the popular Park Bistro, where he met chef Philippe Lajaunie. Diot and Lajaune then designed and opened Brasserie Les Halles in 1990, with José as Executive Chef. José would take more of a management role and passed on the torch to celebrity chef Anthony Bourdain. With his restaurants, José decided to bring his classical style of cooking to the kosher community. He opened Le Marais NY in 1995 with Philippe Lajaunie in the Times Square area. It is the city's only kosher French brasserie, renowned for its excellent cuisine that appeals to diners of all kinds. Its specialties range from steak au poivre to coq au vin and steak tartare. Le Marais NY is known for its in-house retail butcher shop. José’s cooking style is bold, honest and very much ingredient-driven. When appropriate, José likes to use strong seasonings like cumin, and often brings Portuguese accents to his cooking. He doesn't believe in putting too many ingredients in one dish or on one plate, nor does he believe in replacing simulated ingredients for the real ones. 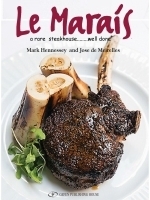 Some of his very favorite dishes to prepare are simply roasted game or the classic pot au feu. When making the menu for Le Marais, José’ chose for the most part, dishes that need little to no replacements of ingredients to make it kosher. With the exception of margarine for butter, Le Marais’ dishes are funsamentally kosher and can be enjoyed by all who seek great meats and terrific foods. Whether it's cooking a classic steak au poivre or coming up with numerous specials served, Chef José de Meirelles' passion for his craft and attention to quality and technique are the winning combination for everything he creates.